On this page I will attempt to make sense of these terms so often used by breeders. 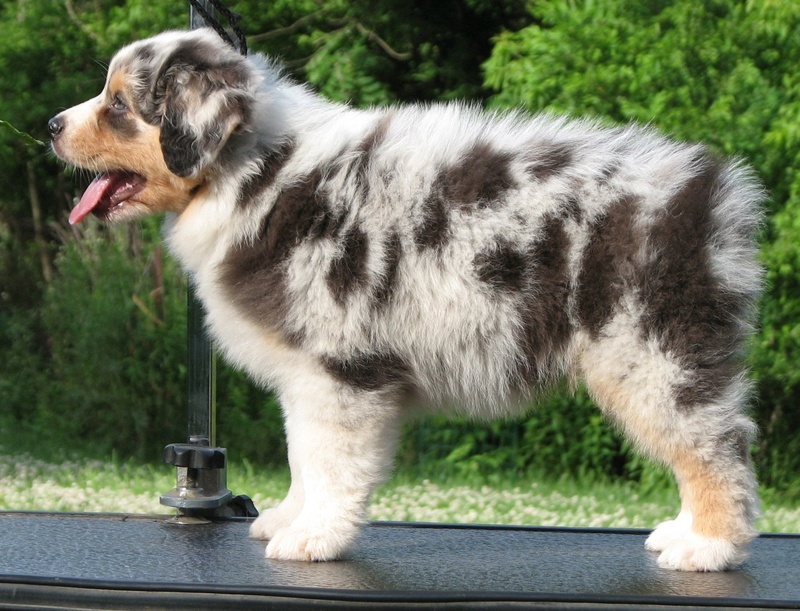 I know a lot of folks who are new to the dog world may not understand the terms and how they are applied to the purebred dog, in this case the Australian Shepherd. Bear in mind I am not an expert, but have studied the structure and movement of canines for years, as well as seen it in action in my many years of dog watching. In seeing working sled dogs in action, wolves and many breeds of dogs do their jobs, I have come to understand why dogs are supposed to be built the way they are. I am still constantly studying and learning more on this topic, as I strive to thoroughly understand good structure and movement and how to apply that knowledge to my breeding program. Also, bear in mind there is no "perfect" dog in terms of structure. All will have some good points and some less than ideal points. The job of a good breeder is to try to select mates that will accent the good points and reduce the bad ones. Then you have to pick the puppy or puppies that have the best of what you wanted. Even a litter of puppies from champion parents, and from a long line of show champions, won't be perfect, and not all the puppies may be capable of being show champions. 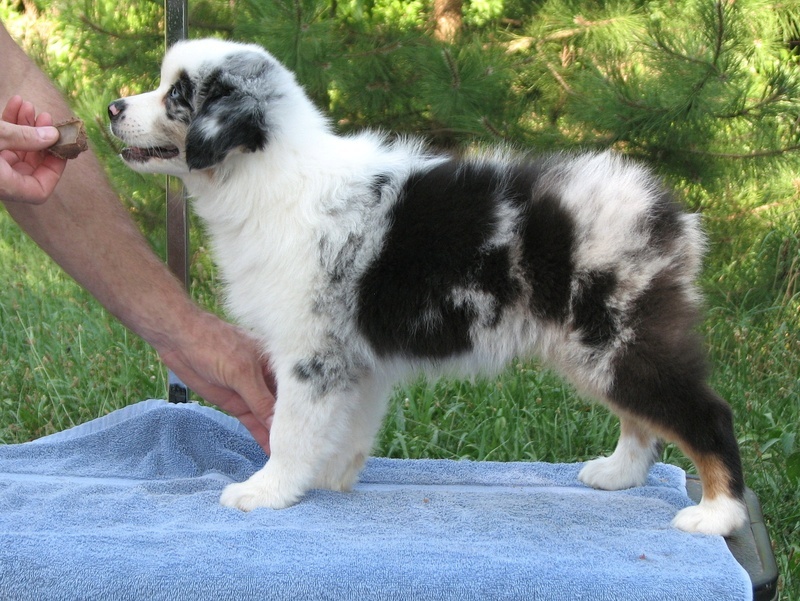 Each puppy should be evaluated based on the "Breed Standard" to see how well it meets that standard of excellence. 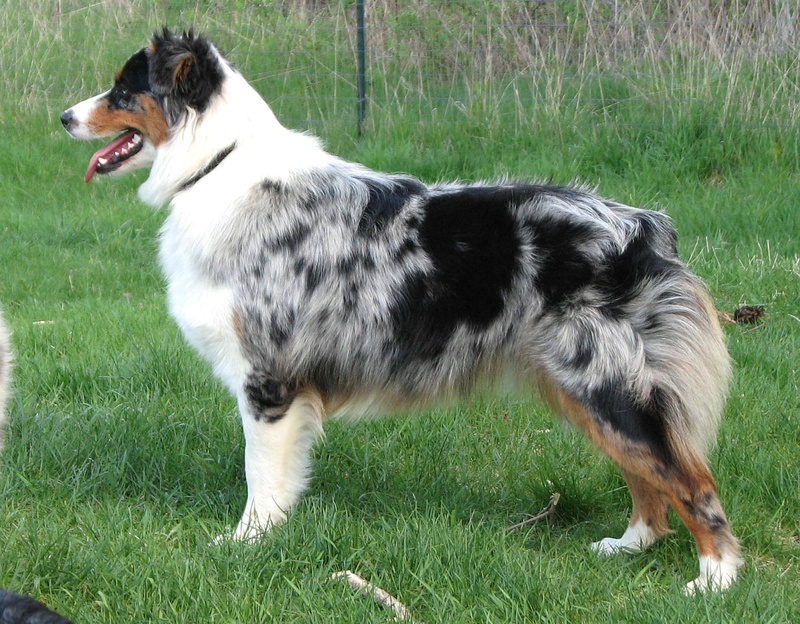 The breed standard is a written description of the "ideal" version of that breed. 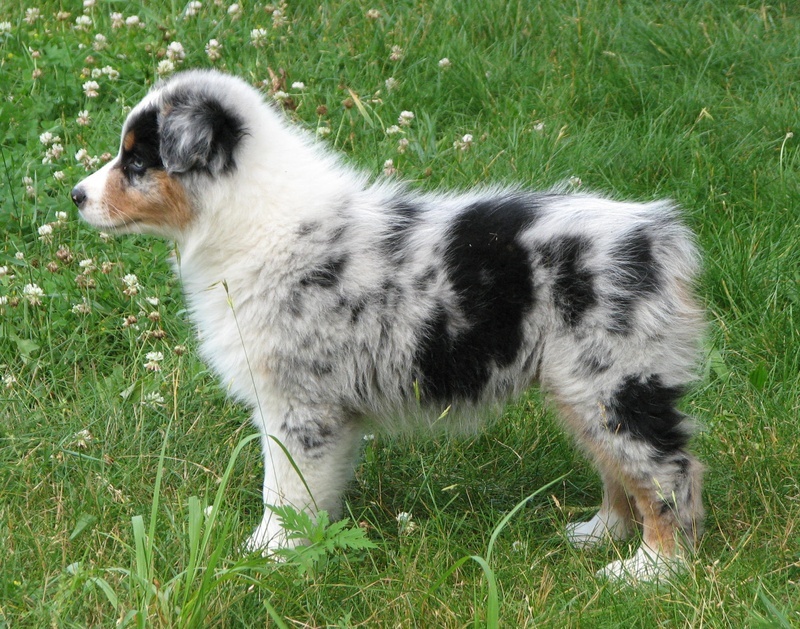 It will describe in detail all the qualities, both physical and behavioral, that the particular breed should have. It is the blueprint of all good breeders. Just as a basic primer, I will define some terms in my own words and those that may be easily understood by the average dog owner. By structure we mean how is a dog built, or put together. We look at various traits such as the topline (line of the back), the neck (length, shape and where it comes off the body), the front and rear legs (looking for their angulation, or how they are shaped and put on the body.) By angulation, we are measuring the angles of the various joints. 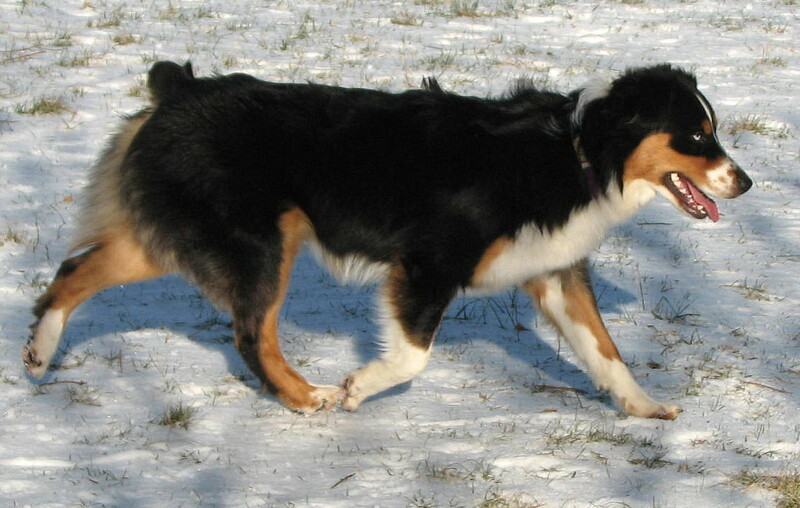 By movement we mean how a dog moves at various gaits, but is usually evaluated the trot. If a dog has really good structure, he will usually have good movement, making him able to stay sound and do his job better than a dog with poor structure and movement. We can get really detailed and talk about various aspects of dog anatomy and I will try to go there soon. Trying to breed for optimal structure for our breed not only makes them look good, but it helps them have the physical qualities to perform their work or even just stay sound and healthy as a pet. Dogs with poor structure may break down early and suffer from various physical issues such as arthritis of the joints, and other issues, especially if they work or play very hard. There is a reason dogs should have a certain type of structure and it almost always relates to keeping them sound and fit for their entire lives. When we say type, we mean how well does the breed exhibit physical qualities which set the breed apart from other breeds. 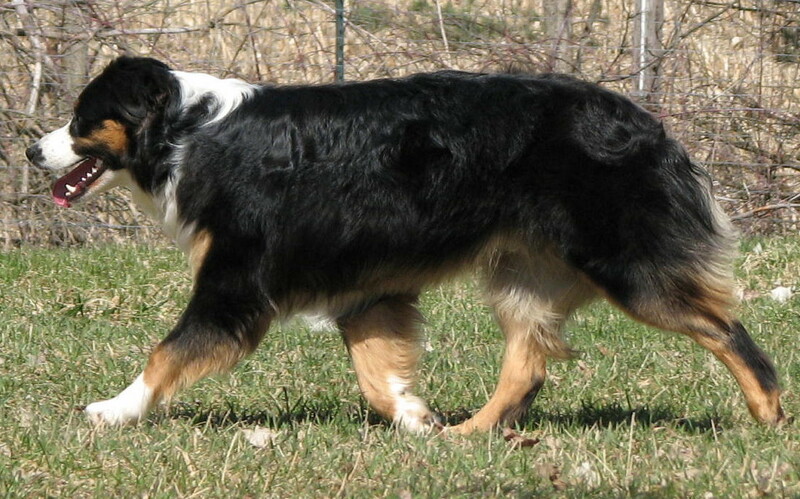 There is a written breed standard for purebred dogs, and for Aussies there is one in AKC and one in ASCA. They are mostly similar and if you want to see them they are on the websites (http://www.akc.org/ and http://www.asca.org/). 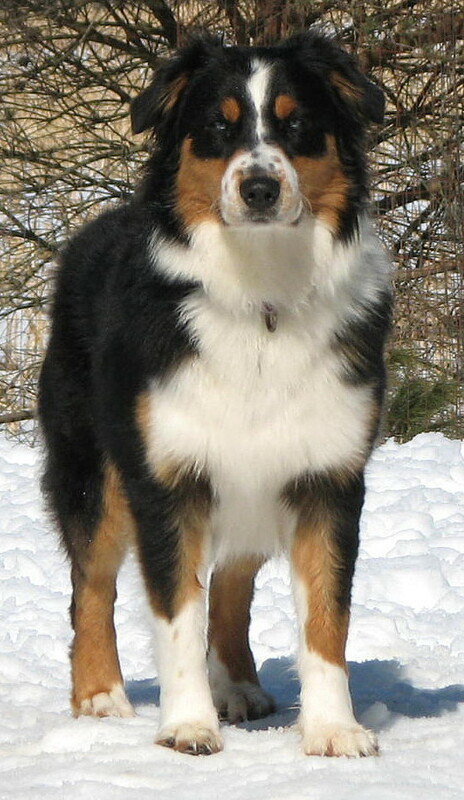 Dogs who have the physical qualities that exemplify the breed standard are said to be "typey" and that is a good thing. 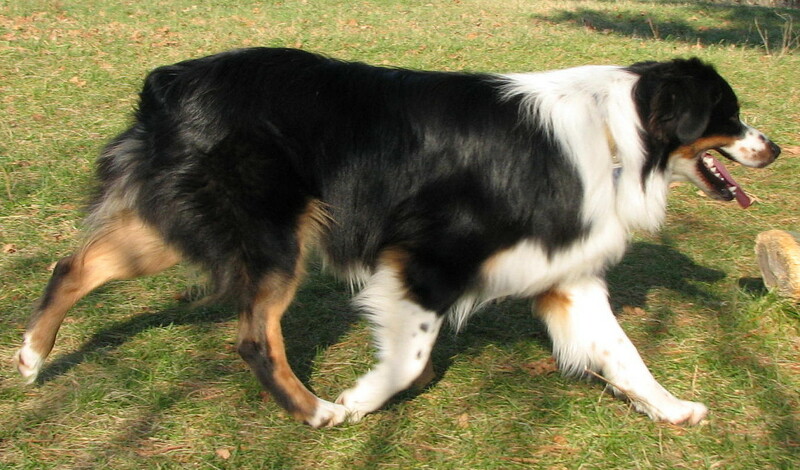 Dogs who deviate substantially from the standard are said to lack type. 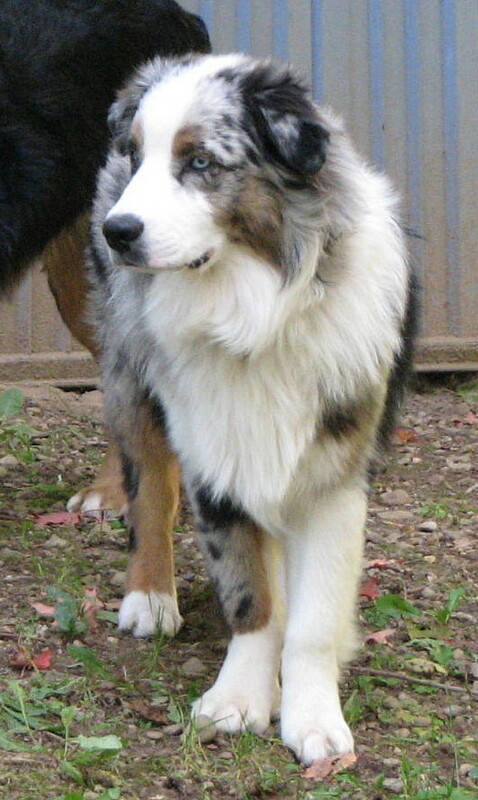 Some examples with Aussies would include their head style, ear set and size, markings, color and coat type, and other features that make them recognizable as Aussies and distinguish them from similar breeds such as border collies. Smooth, free and easy; exhibiting agility of movement with a well-balanced, ground covering stride. 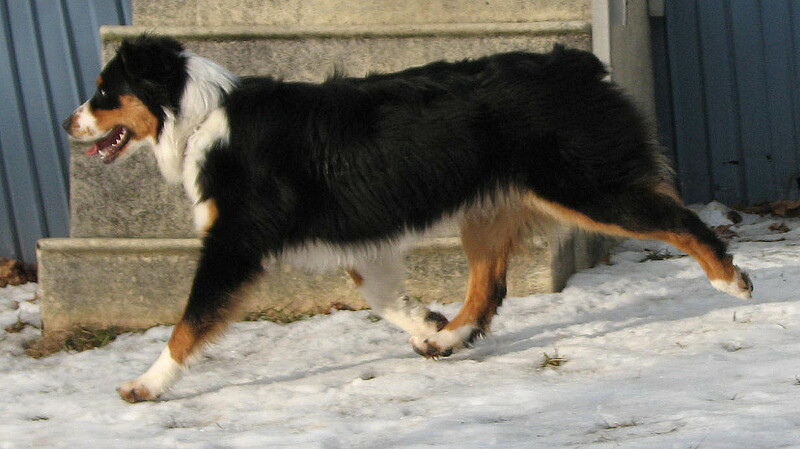 Fore and hind legs move straight and parallel with the center line of the body; as speed increases, the feet, both front and rear, converge toward the center line of gravity of the dog, while the topline remains firm and level. If a dog moves well it should be able to work tirelessly all day and also stay sound. I will add more photos of movement below, as well as making a separate page just devoted to movement photos. I will also highly recommend you order this book from Shalako Aussies. I am not connected with the author in any way but sharing a love for the breed and an interest in deeply understanding and being able to accurately assess dogs of this breed. This book goes into far more detail than I will on this page, so rather than try to duplicate the information, I will offer the link. Another thing I want to discuss is how to assess an adult dog, as well as how to assess puppies in a litter for all these traits. A good breeder will spend a lot of time doing this, and trying to select the puppy which has the most of the best qualities to take into the next generation. 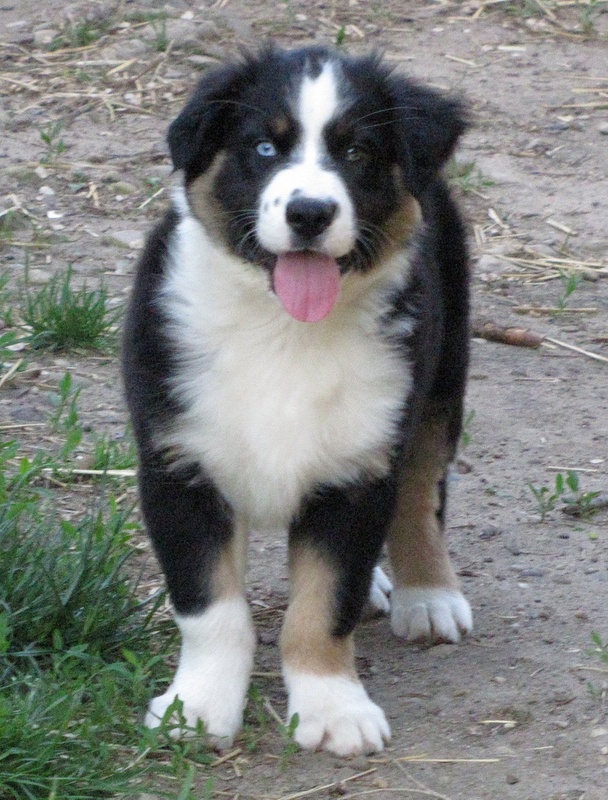 Beware of breeders who seem to focus mostly on coat color or markings, eye color and such. These are less important traits in the big picture, as a good dog can be most colors, and a bad dog with "pretty" markings may not be sound or worthy of passing on it's genes. (And when I am talking about markings, I am talking about the range of marking in the acceptable range, not obvious mismarks. You can see more of that on my "Eyes, Pigment, Markings" page.) 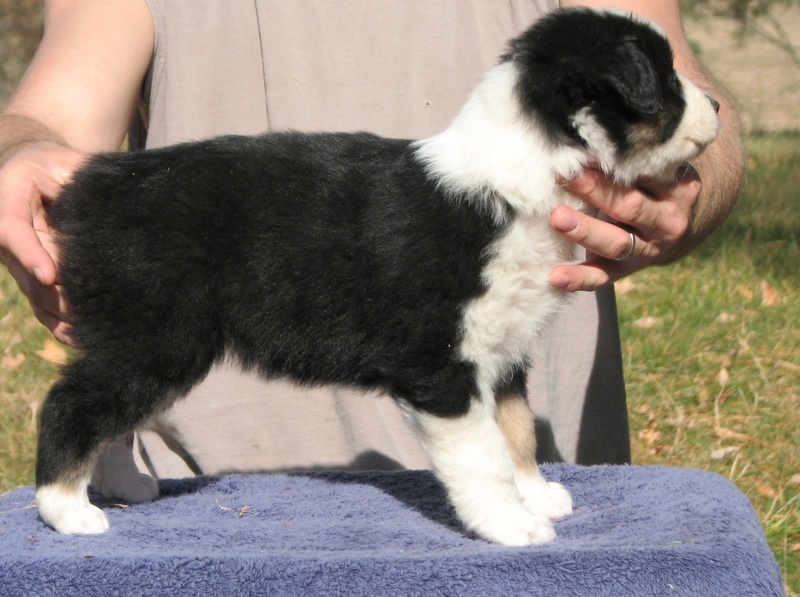 What I hope to do is add some good photos of pups at 8 weeks, and talk about the structure we see, and then post a photo as an adult to show they they turn out. Needless to say this will be a work in progress. I wanted to add a link here to a great website illustrating many of these topics, and will add my own photos as well. 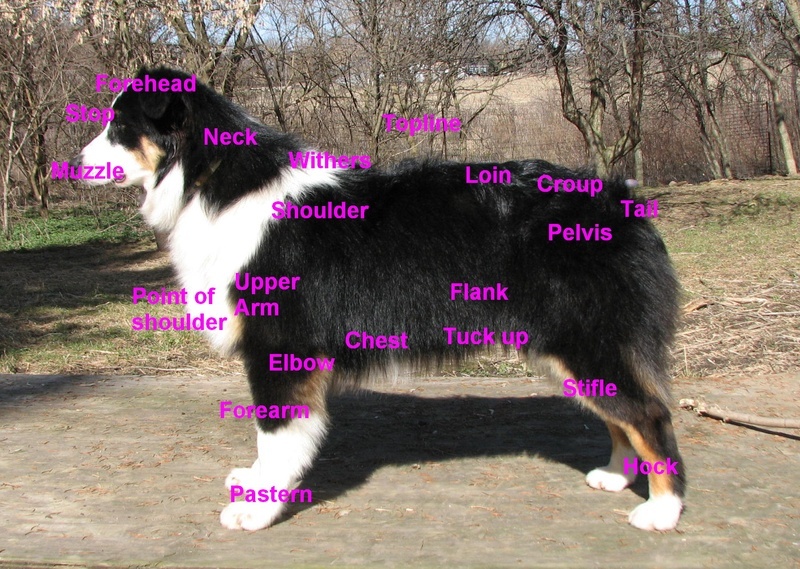 This picture shows some of the terms we use when talking about dog structure. I wish i could make it more detailed and will if I can figure out how to use the software to do so! In this section I will show puppies at about 8 weeks of age, and talk about the qualities they show, and then will show them as adults so you can see how they turned out. I want to add more as I can, but this will get us started. This is one of the tools I use to evaluate my puppies as I make my choice of which to keep. Many good breeders do the same. Ideally you do this at 7-8 weeks of age, as that is when many feel a puppy is as close to a miniature version of what they will be as adults. 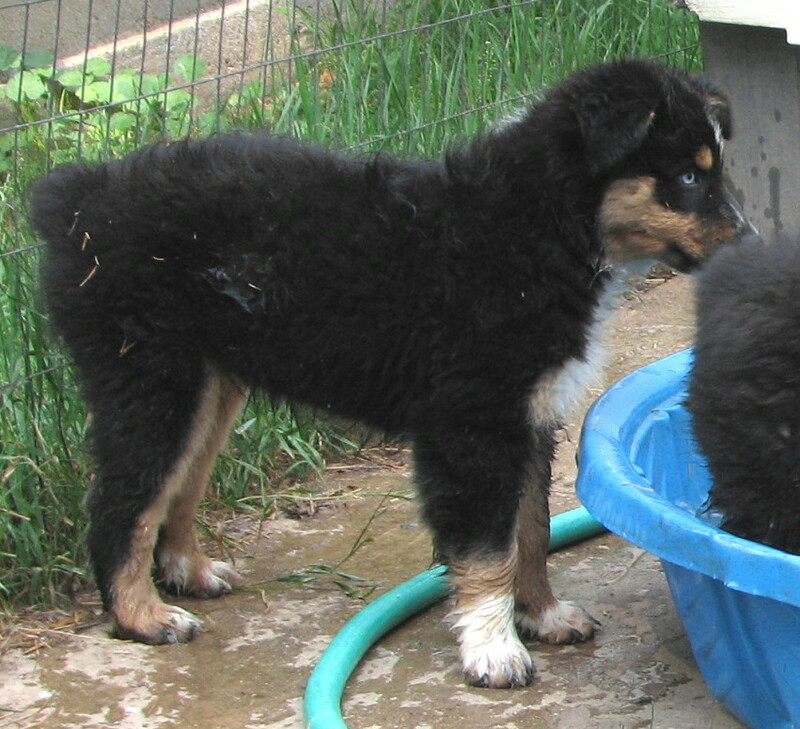 As they grow, they may change proportions but usually come back to similar ones that they have at 8 weeks of age. In both these photos, one at 9 weeks of age and one at a year of age, you can see similar features and proportions. She has a nice length and positioning of neck, nice front including shoulder and chest, nice rear angles with shorter hocks. Her topline is good but not ideal as there is a little rise over the loin and slope to the croup. This makes her quite able athletically but the standard calls for a level topline. You can see she has this as a puppy and as an adult. I wanted to include a few photos of pups or dogs with less than ideal structure, to give you something to compare to. These pups will still make nice companions but may not be the best choice for a higher level of performance, working or competitive conformation showing. In looking at these two pups, some structural faults are readily apparent. With the tri pup on the left, his rear is faulty. There isn't much angulation in the legs and they are too far under him. That is probably due to the wrong angle of the croup. His front isn't great either, he's "toed out" and lacks chest. He has a shorter neck. He is not a good candidate for show or competitive working or performance, but will make a good companion. In the merle pup on the right, she has a shorter neck and hound type ears (meaning they are too big and heavy, and hang too low). She is "overdone", meaning she is overly thick and stocky, especially for a female. She has a little better rear angulation but still not great. She does have some chest. It looks like she's a little roach backed but it's fur. (By roach I mean a curve to the topline, not flat or level like a table.) She too will make a nice companion puppy. By learning to evaluate puppies, breeders can help to match them with the right owners, to meet their goals. If a person wants a highly competitive dog in any area (working, show, performance events such as agility) it pays to know what kind of type and structure you need, not just the personality traits that are ideal. In this series of photos, I will show some various dogs moving and point out some good and bad traits. This dog has balanced movement, but not as much reach and drive due to lack of angulation in his front and rear. He is a little roached in the back as he moves, and he moves downhill. This is from lack of shoulder angle and a short upper arm. His foot timing is decent. This dog above is also closed to balanced but has a bit of rise over the loin. 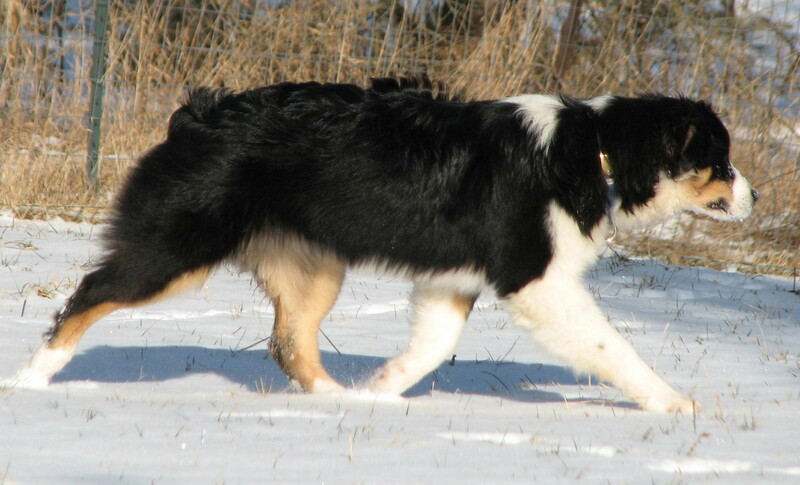 In this picture it looks like he is a little high in the rear but he is moving slightly downhill. The dog above has balanced movement too, with a little more reach and drive. She has a nice level topline too. She is not moving fast enough here but has decent foot timing, not overreaching. This is a half grown puppy pictured above. She is balanced with more reach and drive, but is a little roached as she moves. Assessing movement as a dog grows is good, but don't give up if they looked good at 8 weeks of age, as they may come back to what you saw then. This young girl has nice reach and drive, with her reach extending to her nose. She is balanced but does overreach with her feet under her. She is shallow chested and out a the elbow, but does move from the elbow which is good. Here are two photos showing fronts. The one on the left isn't perfect and I will add a new one as I find a better one. This dog has a nice front, with straight legs and nice feet. Even though she's standing on slightly uneven ground, you can see her structure. The dog on the right has a very poor front. He has what some call "fiddle front" where the upper legs are sort of bowed, and his lower legs "toe out". He is standing with his legs fairly close together so it doesn't show the fiddle shape as well, but you can see the obviously less than ideal structure. This type of structure will impair his ability to move soundly if he was a working or performance dog. He will make a great companion. Below is a photo of a 10 week old puppy with a very bad front. This is usually genetic and often does not correct. 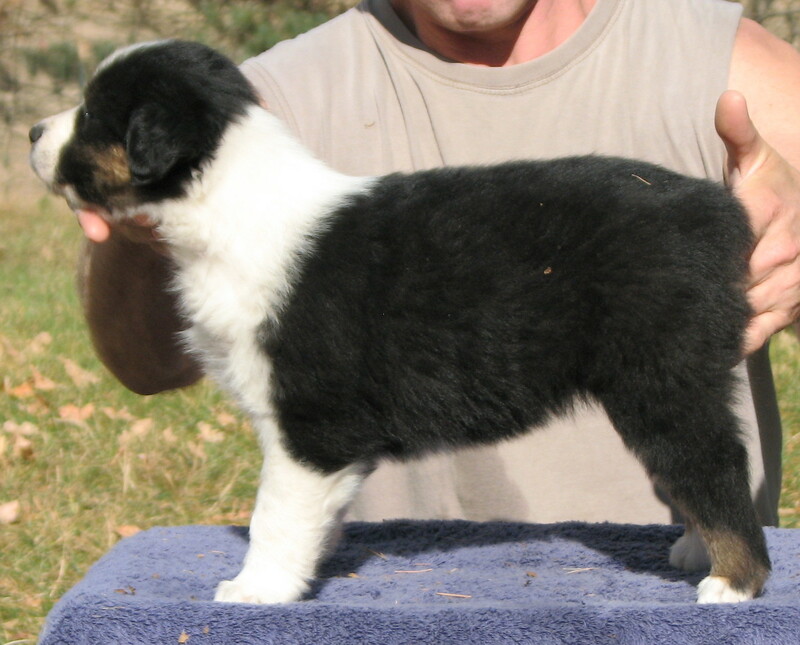 This photo shows a puppy in the process of being "stacked", or stood in a position to best evaluate her structure. At the time the photo was taken, her left front leg is still too far forward. her left hind leg needs to come under her just a bit, so it's perpendicular to the table, and her right hind leg needs to go back. Most people will use bait (in this case home made liver treats) to teach the puppy to enjoy the process and reward it for holding the ideal position. Good bait and training can also help reward an animated, eager expression on the dog once it begins to be shown. In the series below, I added photos of a pretty good stack, and two that show how incorrectly stacking the puppy can make some structure seem bad. These puppies were just five and a half weeks old, so aren't yet at the ideal age for their structural assessment, but we can start to get an idea of how they are built. In these first two photos, we show how you can stack incorrectly, making it appear the puppy is more structurally unsound. In the first one, the hind leg is not placed correctly, making it look like the puppy lacks angulation. Her front legs are a little far forward, but part of that is due to the fact it was her first time learning to stand. In the second picture, his rear is high, even though that isn't how he is really built. Part of that can come from a puppy who isn't relaxed and used to the process, so by giving the puppy short, fun training sessions, it can get used to and enjoy stacking. In these two photos the puppy is stacked more correctly. In the one on the left, her front is still a little forward but not bad, her topline is level and her rear angles show a little more though her hind leg would be adjusted just a little. In the one on the right her topline is a little roached, as she wasn't totally relaxed. She was not totally perpendicular to the camera so that is a little off, but overall it's a fairly accurate view of the puppy. You can see her nice neck in both photos. In this next set, on the left it's the same puppy but a few weeks older, at the ideal age to assess structure. She's turned out very nicely! She is a show quality puppy. The other pup is a sister who is more compact in build, but is also very balanced and correct. All of these topics, if well studied and understood by the breeder, will be a key part to help build a solid breeding program. By that I mean a good breeder has a long term goal in mind, not just breeding randomly to make puppies to sell. In my program, I have very specific goals and qualities I want to lock in the lines of my dogs. 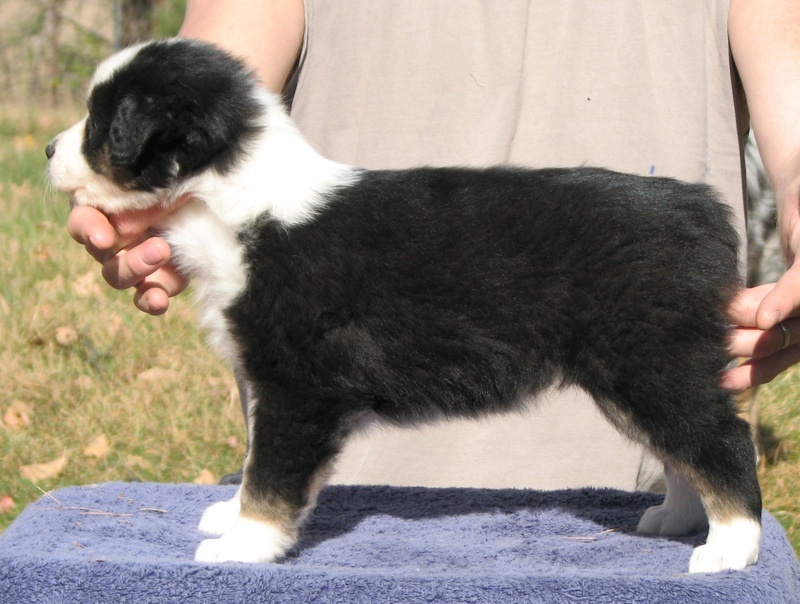 I breed to the standard and want excellent structure, type, health and temperament, and spend countless hours studying all I can to help me achieve this goal. That is a real breeding program. If you want to learn more about these topics, start with anything by Pat Hastings. Her DVD "The Puppy Puzzle" and book titled "Structure in Action, The Makings of Durable Dogs" are great for those wanting to learn and understand more about canine structure and movement, and how important it is in the ability for dogs to function. Also, it's great for breeders as they assess their litters and decide which pup or pups to keep back or sell for show or peformance. This book and the DVD can be ordered online from Amazon or Dogwise. "But whoever hearkens unto Me shall dwell safely, and shall be quiet from fear of evil."